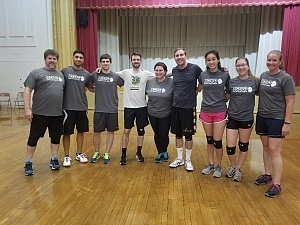 "The Rally Bad Puns" are our latest Thursday Volleyball champion after sweeping both their playoff opponents in straight sets! That includes a 2-0 win over defending champion "Smokin' Aces" in back to back 21-19 games. In the semi-finals they cruised to victory as well, defeating "GOOD GAME!" 21-16, 21-10. Despite a 2-1 loss to "FC Amigos" in their first match of the season, "The Rally Bad Puns" were able to pull together. In fact, after that first loss they went on to win two straight games 3-0. In game 4, our champs would lose to "Smokin' Aces" 2-1, but once again they bounced back by sweeping their final 4 opponents 3-0! After the strong finish to the regular season, they knew they were ready for the tough playoff competition. Overall "The Rally Bad Puns" finish with a strong 8-2 record. They also finish with a +20 set differential, far outclassing the rest of the league. All of those 3-0 wins certainly helped! Congratulations to "The Rally Bad Puns" on the incredible season!